The first Citi Bike station in Hunters Point opened in 2015 at Center Boulevard between Borden and 54th avenues. LONG ISLAND CITY — More Citi Bike stations are headed to the neighborhood this summer. The Department of Transportation is planning to install between five to 10 additional Citi Bike docks in Long Island City, an effort to bulk up the existing bike share network in the area, which currently includes a dozen stations that opened in 2015. The new stations will roll out in late summer, and will be located within the current Long Island City service area, which includes Queens Plaza, Court Square and Hunters Point, according to a DOT spokeswoman. The agency will be taking public input on where the new stations should go at a planning workshop Thursday, March 23 at CUNY Law School starting at 6 p.m. The LIC Post first reported on the event. So far, Long Island City is the only part of Queens that offers Citi Bike. 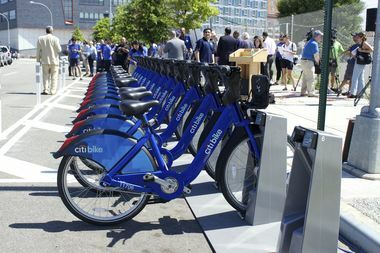 The neighborhood was initially slated to get the blue bikes during the program's initial launch in 2013, but it was delayed until 2015 after equipment was damaged by flooding during Hurricane Sandy. In 2014, officials pledged to more than double the number of Citi Bike docking stations by the end of 2017. That expansion will include Astoria, where planning for the bike sharing stations is already underway. While DOT hopes to continue to expand the program in the future, there are still no concrete plans to launch Citi Bike in other Queens neighborhoods such as Woodside and Sunnyside, according to a spokeswoman.